The Tesla showroom in Santa Monica, California. The official sovereign wealth fund of the Saudi Arabian government may be considering a major investment in Elon Musk’s electric car giant Tesla, and sources say it is “in talks” to do so after Musk let slip via Twitter that he is considering taking the company private in a $60-billion-plus deal at $420 a share, Bloomberg reported on Sunday. ... The PIF and Tesla didn’t respond to requests for comment. Just one day before, though, Reuters reported PIF managers had no interest in securing a larger share of Tesla. That report said the hesitance was in part due to needing guidance from rumored Tesla buyout partner Softbank, which the PIF has invested $45 billion into, and in part because the PIF had already bought into Tesla rival GM Cruise. So take the news from Bloomberg with a grain of salt. 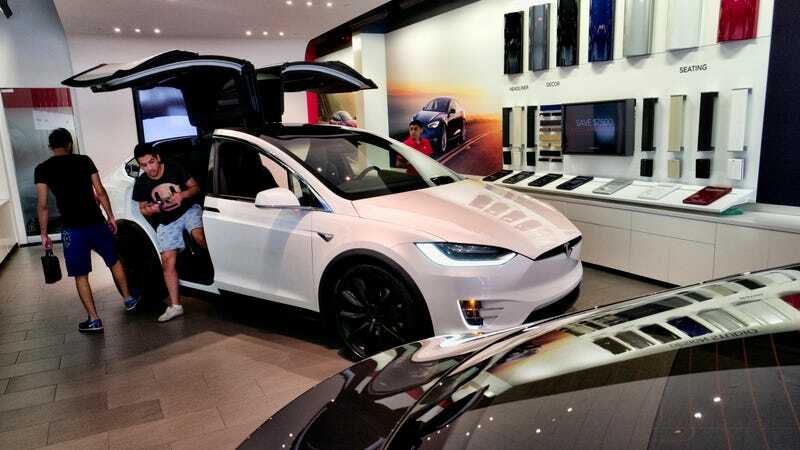 ... A source who is familiar with PIF’s strategy said it was not currently getting involved in any funding process for Tesla’s take-private deal. Musk said in his initial announcement—which some initially took as a joke because 420 is the so-called “weed number”—that funding has already been secured for the deal. That can’t be readily fact-checked due to the inherent secrecy in the bidding process, but it’s possible that Musk only secured part of the funding, one of his partners backed out, or he’s trying to juice the bidding process to get a better deal. The Securities and Exchange Commission reportedly has launched an inquiry into Musk’s tweet, purportedly with the intent of determining whether it was misleading, false, and/or an attempt to manipulate stock prices. There’s also rampant speculation that Musk, who is not exactly known for his wise judgement on what to tweet or not, was bluffing and all of Tesla’s announcements since have been an attempt to weasel their way out of a bad situation that could get the company in trouble with regulators. Yet Saudi Arabia has been looking to expand the PIF to $2 trillion by 2020, which could help secure its wealth (and possibly help entrench its notoriously oppressive monarchy) even if the oil market stops being lucrative enough to carry the country’s economy in the future. In particular, it’s been looking to expand its tech investments; it’s touted its interest in robotics and Crown Prince Mohammed bin Salman is playing up plans to build Neom, a supposed 10,230 square mile megacity and tech hub that would cost $500 billion. Earlier this year, the crown prince was reported to have swung by Silicon Valley, and the kingdom was likely behind a glowing propaganda magazine that hit newstands across the U.S. in March. If Musk does take the company private, there are a limited number of investors capable of providing the necessary funding. Per Wired, those include investors in Saudi Arabia, China, and Japan, with China the likely front-runner due to its plans to require 10 percent of all automobile sales next year be battery-powered vehicles.